Lore: Teferi's second staff and memory crystal? To clarify my question I will be using some card art. However, the answer to this question likely lies in the lore of MtG rather than the art. I bring this up because it is relevant to have a light understanding of how Wizard's of the Coast gets art. Importantly, contracted artists receive a style guide which helps maintain a cohesive feel for certain creature types, individuals, artifacts, etc across sets and throughout the game's existence. Thus despite the shift in artistic style from the "older" cards to the "more recent" cards, the main staff we see him hold in Teferi's Response is likely the same staff seen in Teferi, Temporal Archmage. Likewise, despite some recent cards (e.g. Oath of Teferi) depicting the staff made out of metal, most cards indicate that it is made of something wood-like (even the latest Mythic Edition). where Teferi has two staffs in hand. 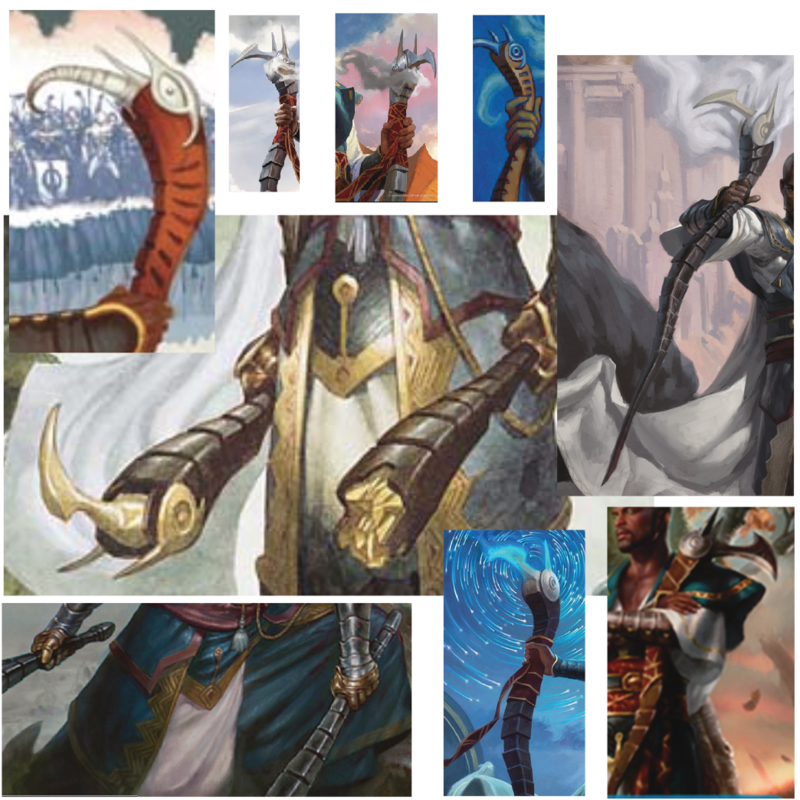 Given the progression of how we have seen his "main" staff evolve from Teferi's Response to Teferi, Hero of Dominaria, I would like to make the assumption that the staff in his right hand (left side of image) is his "main" staff. Feel free to disagree. However, this question is about his other staff (which I will refer to as his "second" staff). From card art, I can find only two cards with art that feature Teferi wielding two staffs and - unlike pyromancer's goggles - I do not believe the staffs are featured on standalone artifact cards. These two cards are: Teferi, Mage of Zhalfir Time Spiral, and Teferi, Mage of Zhalfir Iconic Masters. I just showed the former, and the latter we can not see the tops of the staffs (but they have a similar, shorter, more roundish wood-like handle style). I know that when he is holding two it is because his staff was broken at some point. Beyond that I am not sure. To me that statement is somewhat ambiguous. Does it mean that when he is holding two, he is holding both his broken staff and his new staff? If so, did he get his new staff fashioned to be the same as the prior? Or, if he is only holding one, is because the second was broken? Some may be of the opinion that the second staff of Teferi, Mage of Zhalfir Time Spiral is broken - as it does not look like the other. While I admit I can see how one could interpret the art that way (the gem atop it may seem fragmented) - as the artists of MtG are known for meticulous detail I lean towards the interpretation that the second staff is in that image not broken. Why? We have seen wonky, powerful gems before (e.g. Memory Crystal, Meek Stone), the gem appears to take up more space in the staff than the other sickle/beak adornment of his main staff, the handle seems to match the edges of the gem and are otherwise smooth at the edges. Anyway, whether or not the second staff is broken in that image, based solely on the art, is up for debate - unless someone gets a statement from the artist. 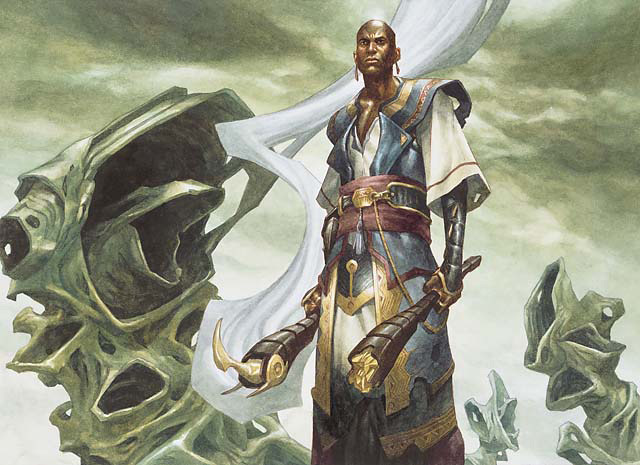 Of note, is that the previous statement is from an artist who drew Teferi, just not a card where he holds two staffs. My question is, lore wise, where is his second staff? Did it break? if so, when and why does he not carry it any more? Why would only Teferi, Mage of Zhalfir (originally from Time Spiral and reprinted in Iconic Masters / From the Vault) be the card which features two staffs (i.e. why wouldn't we have seen his second staff in older cards like Teferi's Moat)? There is one last thing I would like to emphasize from this collage. The core aesthetic features of Teferi's main staff appears consistent across cards that span years. This, to me, suggests that there is a style guide for that staff and while they might look different (e.g. 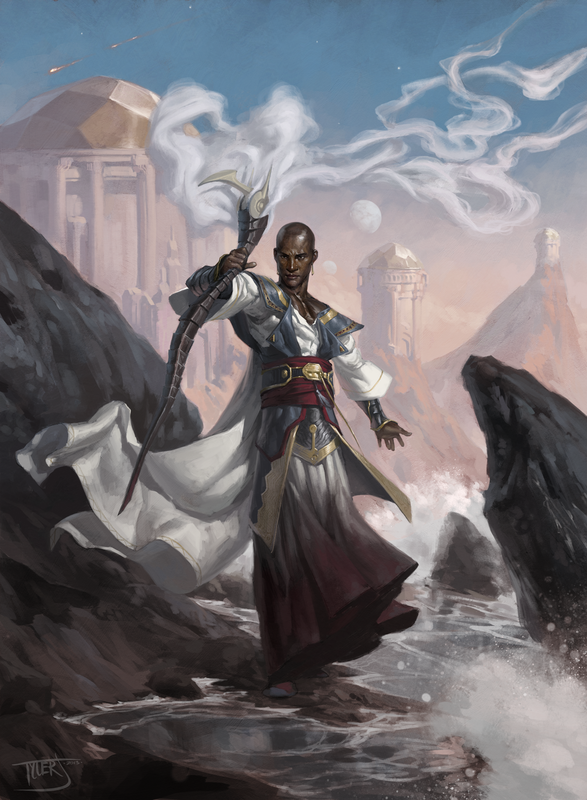 the short staffs of Teferi, Mage of Zhalfir and the long one of Teferi, Temporal Archmage) they are meant to depict the same staff - with some artistic liberties taken. Otherwise Teferi has gone to a staff maker and has had at least 4 different but similar looking staffs fashioned for him. However, like Jaya and her goggles, the design of which has remained very consistent, I attribute such consistency - perhaps falsely - to continuity of his main staff (although it is likely easier to get new goggles in the planes of MtG than a staff...). Check out the broken staff - we've seen it intact on Teferi's Moat and on the cover of the Time Spiral novel. That, ladies and gentlemen, is what we call symbolism. He is holding the remnants of a broken staff in one hand, and one new & intact staff in the other. a. ... And the broken staff is on our right. b. ... And the broken staff is on our left. Both halves are from one staff, now snapped in half. I don't believe 1a is possible, because Teferi's Moat and the Time Spiral cover art both depict the "bird beak" staff seen on other cards. The staff in Teferi's right hand does not resemble these. So it must be the staff on our left that's broken. 1b is also problematic, because the article implies that you can tell just from looking at the picture that the bird beak staff is broken. But the bottom of the staff is obscured by Teferi's body. You might argue that the staff is still evidently broken because it would otherwise be long enough to extend past Teferi's right side. But you could just as easily argue that the perspective could hide a complete staff, or the artist simply could have taken creative liberties and made it short. So there's no strong evidence either way. But the article makes it sound like it's obvious. It's as if the author is taking for granted the fact that we can tell the bird beak staff is broken, because the other half of it is in Teferi's other hand. This leads me to believe that #2 is the most likely possibility. Assuming that the card depicts two broken halves of one staff, it becomes easy to determine what happened to the non-bird-beak half: by the time of the Dominaria block, the two halves have been rejoined into a complete single staff again, as depicted on Teferi, Hero of Dominaria. This also nicely dovetails into the symbolism of the Mage of Zhalfir art: when Teferi loses his planeswalker's spark in Time Spiral, his card depicts a broken staff; when he regains his spark in Dominaria, the staff on his card is whole again. Not the answer you're looking for? Browse other questions tagged magic-the-gathering game-lore or ask your own question. What should Mono-B put in sideboard against GW-Tokens? When to choose what colors I will play and vary my picks accordingly?